Rhubarb and custard cake. From vegetable patch to tea time next to the blue garden door, in under 2 hours! These cake forks are very pretty. A complete set of 6 English cake forks with a very pretty repeating diamond pattern at the top of each handle, making them perfect for a vintage tea party. They are stylish and pretty enough to work well with any era of tea party plates and china. 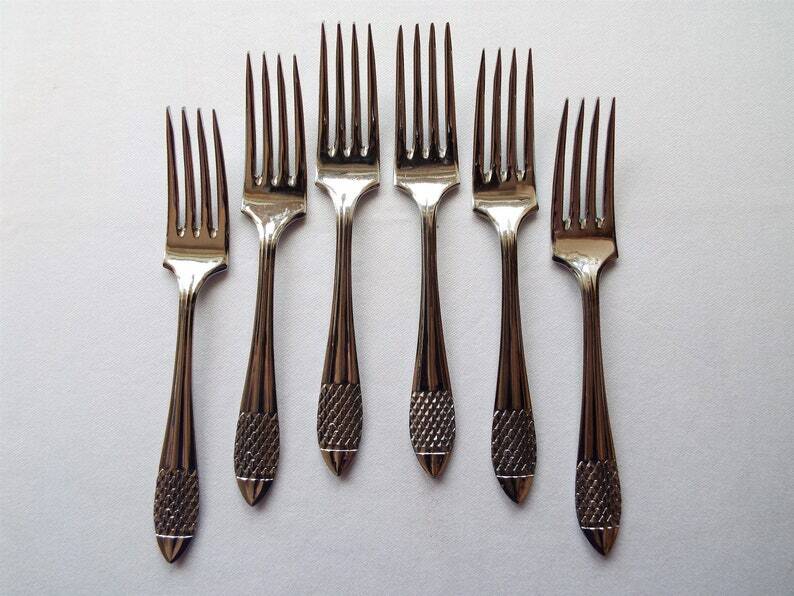 This is a complete set of 6 forks which are very elegant indeed. The reverse of each fork is stamped 'Chromepride Chrome Plate On Nickel Silver Sheffield England'. They are excellent quality and a lovely weight, not thin and flimsy. As they are chrome plated, they will not tarnish or need polishing. They have an exceptionally bright mirror shine. I am very proud to be able to offer these forks in my shop, as they were made in my local city of Sheffield. Sheffield is renowned for its centuries old metal working and cutlery manufacturing history. This set would make a perfect vintage birthday or gift for a tea and cake fan, or a baker! Their elegant design would set your pretty afternoon tea cakes and pastries off with style and would work especially well at an Easter tea time, spring or summer garden party. Please ensure you read the condition and dimensions sections below before ordering. These forks are in excellent condition, in fact, they look like they have hardly been used! They are still very bright and shiny and would look fantastic on a vintage tea plate with a pretty cake. Please just ask if you would like further photos. Any further wear is commensurate with age and use. Each fork measures 14.1cm in length (5 3/4 inches) approx. Your forks will arrive carefully, with FREE beautifully gift wrapped packaged in vintage style brown paper and ribbon. **Please read my shop and shipping policies before ordering**. I will combine postage wherever possible on multiple orders to give you the fairest postage price and always refund shipping overcharges. Please contact me before ordering if you would like a combined shipping quote for multiple items and I'll be happy to provide one. Vintage Jam Spoon or preserve spoon, English silver plated. Ideal for a cream tea of jam and scones. Perfect for an afternoon tea party! Vintage Jam Spoon, 1930s English silverplate and English sterling silver preserve spoon with cream plastic handle. Perfect for a tea party! Vintage Jam Spoon, 1930s English silver plate preserve spoon, cream plastic handle and pretty decorative engraving. Perfect for a tea party!